This morning, I awoke fresh with a tip I'd like to add to a video for you ... now I'm just figuring out how to stage it. So it's coming soon, along with some cards. But in the meantime, I wanted to share some smiles I received this week that were both unexpected and unusual. 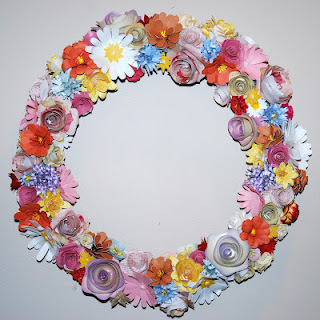 You may remember the floral wreath I made for Mom for Mother's Day? Well, once a week I call Mom and Dad in Florida ~ almost always on a Monday afternoon is my time to call. Mom and Dad always each pick up their own phone extensions so it's like a conference call. Mom was saying how much she truly loves the wreath I made, and how she thinks of me every time she walks by it hanging near her kitchen. Lovely. Not unusual. But then Dad chimed in: "Ellen, I had a chance to look at that wreath closer. It really is beautiful -- a work of art." Well, I about fell off my chair! Dad?? A softie!!? A little later, same day: Hubby John said something that made me smile. I was bemoaning how I didn't want to invite a neighbor-lady into our home during a conversation we were having on my porch, simply because I didn't think my home was neat enough for white-glove scrutiny. You know the sort. John's comment: "Never feel uncomfortable. The fact is, we love our home so much that we actually use it, it's not just for show." I guess that's why my PaperJungle is such a mess: well-loved, and well-used. Happy Friday, all. Glad that your parents LOVE the wreath. It is beautiful. I just love this wreath or Garland depending how you think of it I suppose. Would you mind sharing how to make it with me, I would love to make it for my mum to give her a cheer when she sees it. I made two 3d flowers and put them onto plates for my mum out of paper prints and she has still got them brought them to the UK with her and they are now over 12 years old, still looking great. It is so nice to have your family praise your work... and bring a smile. Thanks for sharing. It's those special unexpected moments that really mean something. Your work is beautiful, and your husband is SO right! It's not the condition of your house or your clothing, but your inside that makes you beautiful! Keep it up, your followers see it all the time.